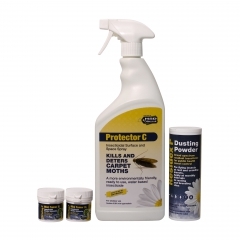 With our range of highly effective moth removal and prevention products including pheromone traps, sprays and smoke bombs with unrivalled customer care and product knowledge, getting rid of carpet moths has never been easier. The two main types of insect which can cause serious damage to textiles are clothes moths and carpet beetles. These two pests appear very different in both looks and habits however both eat animal fibres including wool carpets, cashmere and mohair clothing. Ensure that your vacuum bags are changed frequently to remove larvae and eggs from your property. Washing all fabrics including soft furnishings, towels, curtains and linens in the affected area is an effective prevention tactic as moth larvae find these just as tasty as clothes! Provide wardrobes, cupboards and drawers with a thorough clean and wash down if possible and take extra care in cleaning tiny cracks and crevices where eggs might be hiding. Clean suitcases, bags and other similar items you think could be hosting eggs or larvae. 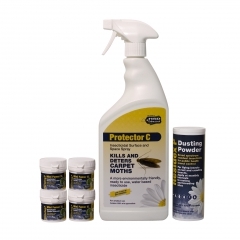 Browse our carpet moth killing and prevention sprays, fumers and aerosols and enjoy free, fast delivery across most of the range.